The unofficial end of summer is coming up this weekend! While many people will use this as a time to squeeze in a bit more travel, if you decide to stay around town, worry not: there is still plenty of fun to be had here for Labor Day weekend! Northern Virginia offers many opportunities to continue enjoying summer fun before we switch over into fall. Below is our annual list of family-friendly special events and activities to enjoy with the family so you can have a splashin’ good time — while you still can! 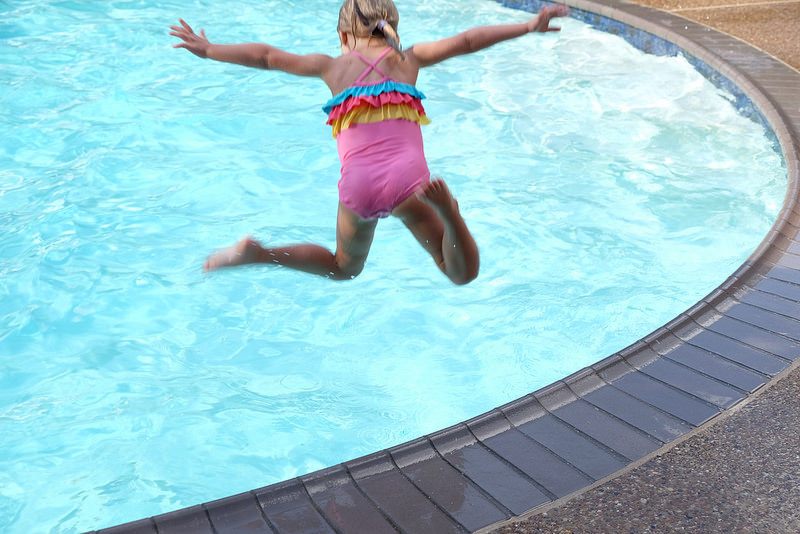 Get some last splashing in before pools close for the season (most of them shut down after Labor Day)! We have 10 great outdoor water parks in our immediate area, so be sure to see our list! Need something faster and simpler? Check out our list of public splash fountains/spraygrounds, too! Great Country Farms (in Bluemont — further out, but worth the drive!) kicks off the fall season with its Apple Gala & Cider Festival every weekend in September. In addition to all the usual farm fun (jumping pillow, mini-golf, slides, farm animals, wagon rides, and more), there will be apple picking, cider tastings and antique hand crank cider pressing demos and live music. Regular hours and admission fees apply. This two-day event (Sept. 2-3, 2017) at Holy Transfiguration Melkite Greek Catholic Church features food, dancing, live music, and kids’ activities such as pony rides, a moon bounce, and games. Admission and parking are free, and the event takes place rain or shine! The 11th annual Jazz & Blues Festival takes place on Saturday, with music from several acts between 2 pm and 8 pm. Admission is free and the event is for all ages. The NSO performs a free Labor Day Concert each year in Washington, DC, on the West Lawn of the U.S. Capitol on Labor Day Sunday. The concert features patriotic tunes and classics from the American Songbook such as show tunes. The concert starts at 8 pm, but you can arrive as early as 3 pm when the gates open for the rehearsal at 3:30 pm. In case of inclement weather, the concert will be moved to the Kennedy Center Eisenhower Theater. This festival is a celebration of Pakistani culture in the United States. The all-ages event includes cultural performances by noted and popular artists from Pakistan, ethnic Pakistani cuisine, handicrafts, boutiques, sports, and children’s entertainment. The biggest Labor Day event in our area is the annual festival in downtown Herndon. This all-day (11 am-5 pm) celebration on Labor Day Monday has music, cooking demos, a craft show, samplings of a dozen Virginia wineries, local mircro breweries, food, and more! Admission with wine and beer tastings is $20, entertainment only (no alcohol) is $10, and kids 12 and under and designated drivers are free! The festival is in downtown Herndon at the Town Green (777 Lynn St.). Love vehicles? The annual Labor Day Car Show has hundreds of cool cars and other vehicles for you to check out! On display will be street rods, foreign cars, customs, antiques, trucks, muscle cars, motorcycles and more! There also will be food and music. The event is from 8 am to 3 pm on Labor Day Monday and is free to spectators; donations are welcome. Please note: this event used to be held in the historic town of Clifton, but since 2016 it has been in the City of Fairfax. Monkey Joe’s Dulles, a fun indoor playground with giant inflatables, hosts two great specials today: $12.99 for admission and a $5 arcade game card OR $16.99 for admission, a $5 arcade game card, and a free Virtual Reality coupon. Know of another Labor Day weekend that our readers might like? Let us know in the comments below or fill out an event calendar submission form. Share the post "Labor Day family fun in Northern Virginia"